I didn’t have children. My husband also died in ‘82, in the late December, his name was Reshat Isa. And since then, I only read, sometimes I do handmade stuff, I used to work gobelin tapestries and I still do sometimes. […] I really really miss that time. Even though I am old now, I really miss the staff of that time, we were a great staff. I still miss them, I come here to take books, sometimes I come to visit them, ‘How are you, what’s up?’ and they also invite me, the director, whenever there are library holidays. Myzejen Hoxha was born in 1939, Kukës, Albania. Her parents were from Gjakova and were working as traders in Albania. Her five-member family moved to Prizren in 1942. She went to Higher Professional School for librarians and took courses for librarians in Pristina and Belgrade. Myzejen Hoxha is considered to be among the first Albanian librarians. On May 1, 1956, she opened the first children’s library in Prizren. 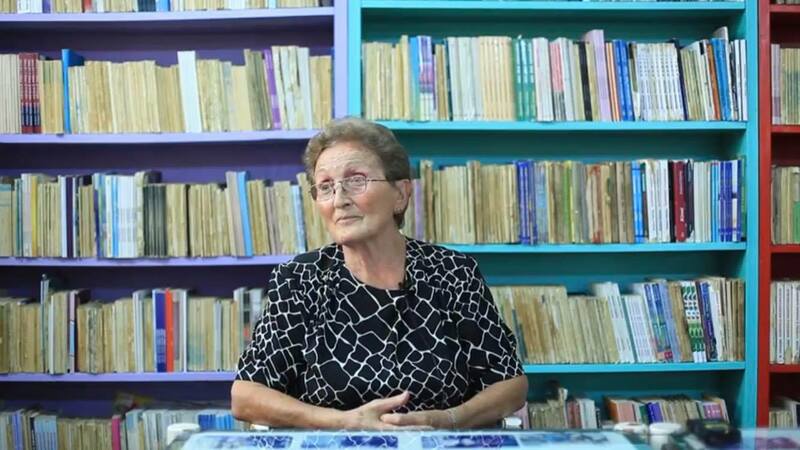 She worked for that library until she resigned because of her refusal to accept the Serbian system in 1992.